JABALPUR: The Aam Aadmi Party (AAP) leaders have given 'Krishak Maran'award to Shivraj Singh Chouhan-led BJP government for the firing on farmers, which resulted in six deaths. 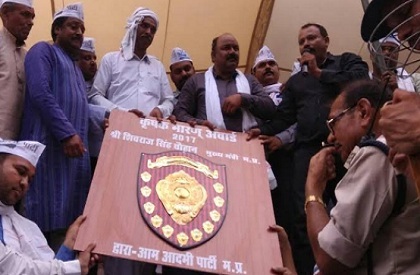 AAP convener Alok Agarwal handed over the shield of 'Krishak Maran Award' to officials, urging them to send it to Shivraj Chouhan but officials refused to take the shield. Madhya Pradesh has been winning Krishi Kraman awards from the Centre. But after the Mandsaur killings, the situation on the ground came to fore. Farmers came to streets all over Madhya Pradesh, demanding fair prices and loan waiver. AAP leaders staged a protest in Jabalpur. They gave a memorandum regarding AAP's demands for the welfare of farmers. The officials took the memorandum but didn't take the 'award'. The AAP workers had organised a protest in Jabalpur. They also courted arrests. Talking to journalists, the party leaders said that AAP will continue to raise the issues of farmers in Madhya Pradesh.